Each former US President gets his own presidential library. 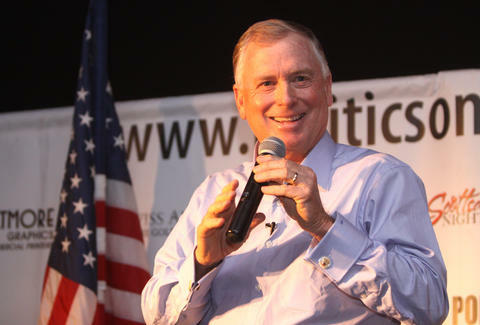 Veeps, however, make do with a spot in the Quayle Vice Presidential Learning Center, also known as the Dan Quayle Museum, in Huntington, Indiana. Opened in 1991 and originally dedicated only to J. Danforth Quayle (who, in case you forgot, or never knew, served as VP for one-term president George H.W. Bush), it’s expanded to include all 47 (soon to be 48) of the men who’ve sat a heartbeat away from the presidency. Since yet another Hoosier (Trump’s wingman, Indiana governor Mike Pence) is angling for the job of First Second Banana, we decided to take a look. Here’s what we learned about the Center and the vice presidency in general. ... because this is where Dan Quayle spent a good portion of his childhood, and began both his law practice and political career. 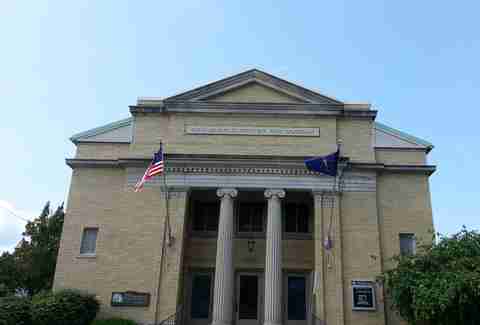 If the building looks a bit churchy, it's because it used to be a Christian Scientist church. The whole second floor is devoted to the building’s namesake -- hardly a surprise, since Quayle gave it 425 boxes of his papers. Other exhibit oddities include a set of his golf clubs (Quayle loves his golf), a toy truck he played with as a child, and the gown his wife wore to the Bush inauguration. There’s also Quayle’s ragged-looking law school diploma, which was chewed up by the family dog, Barnaby (who’s also pictured). Quayle isn't the only Indiana vice president. Not by a longshot. For decades, Indiana was considered a pivotal swing state, with Republicans and Democrats vying to win its favor, which explains why five veeps (six if Pence makes it in) hail from here -- so many that the state was once referred to, in all seriousness, as the “cradle of vice presidents.” Too bad the title doesn’t hold water. New York has produced the most veeps, with eight so far. Vice presidents have their own theme song! Vice presidents have their own music, but for a long time, they had no place to live. From day one, the office of vice president has been treated as an afterthought at best, a lame embarrassment at worst. The veep’s only consequential duty is to preside over the US Senate and break tie votes if necessary. His other assignment is to stay out of the way. It wasn’t until the 1970s that he got an official residence -- Number One Observatory Circle, on the grounds of the US Naval Observatory. Before then they either holed up in boarding houses, or (in the case of Thomas Jefferson) chilled in their hometown cribs. 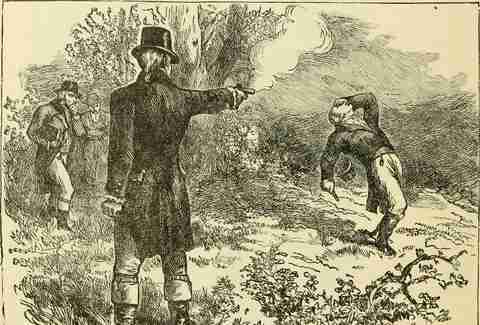 Speaking of Jefferson, his own vice president was Aaron Burr, the murderer of future Broadway sensation Alexander Hamilton. After gunning down Hamilton in a duel in 1804, Burr went on the lam, during which (among a great many other shenanigans) he explored the idea of taking over Spanish-ruled Florida and turning it into his own kingdom. When this didn’t pan out, he returned to Washington, DC and resumed his vice presidential duties. And no one (well, almost no one) batted an eye. Because that’s how people rolled back then. Sorry, those fateful shootin’ irons reside at a slightly higher-profile facility called the Smithsonian Institution. Though each VP at Quayle’s museum gets his own first-floor display area, the exhibits aren’t exactly A-list. Many, in fact, were acquired on eBay. Be sure to check out the Spiro Agnew souvenir trash can, along with an authentic 1789 newspaper with a story about John Adams (the very first vice president) breaking a tie vote in the Senate. And cut the museum management some slack, because many of the vice presidents are so obscure that finding any artifacts at all was a struggle. Quayle, who once misspelled “potato” in front of a classroom of kids and regularly blurted out pearls such as, “I stand by all my misstatements,” was always getting laughs at his own expense. But the real life of the party (in his case the Democratic Party) was Thomas Marshall of Columbia City. Marshall was legendary for his sick burns, such as, “Indiana is the mother of vice presidents; home of more second-class men than any other state.” His remarks were so saucy -- and relentless -- that his president, Woodrow Wilson, moved his office out of the West Wing so he’d stop joking with White House tour groups. Thomas Marshall wasn’t the only veep to complain about his job. They pretty much all did. The vice president is the human equivalent of a tire donut -- rarely needed, usually ignored. Thomas Jefferson, who served as James Madison’s vice president, described the gig as a “tranquil and unoffending station.” John Nance Garner, one of Franklin D. Roosevelt’s veeps, was a bit less tactful, stating that the job is “not worth a bucket of warm piss.” Roosevelt’s other vice president, Harry S. Truman, said veeps were “about as useful as a cow’s fifth teat,” and Calvin Coolidge (Warren G. Harding’s wingman) added, “I enjoyed my time as vice president. It never interfered with my mandatory 11 hours of sleep a day.” Somebody from HR really should have talked to these guys. Because of Pence, it’s expecting to see north of 10,000 visitors in 2016 -- a record. But don’t expect Disney-esque lines, because most of the guests are school tour groups. If there isn’t a school bus in the parking lot, you’ll likely have the entire place to yourself. General admission is $3 for adults, $1 for kids. ... albeit a tiny one. The somewhat limited stock includes Quayle Vice Presidential Learning Center refrigerator magnets (of course), plus mugs, and copies of Dan Quayle’s two books, Standing Firm and Worth Fighting For. This may be the only place on earth (outside of bookstore remainder bins) where these tomes can be found. 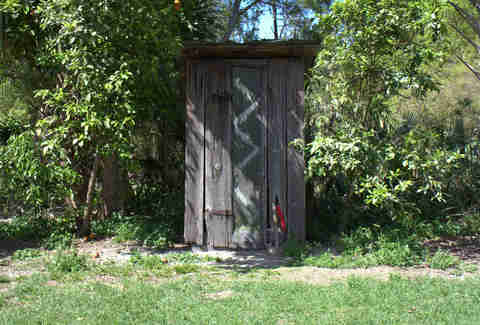 The Huntington County branch of the Indiana Historical Society keeps five old-timey outhouses outside its museum, all bequeathed by a local “collector” named Hy Goldenberg. Another dozen of Goldenberg’s finds sit along a walking trail in the Tel-Hy Nature Preserve, which offers views of the Wabash River, local fauna and flora -- and outhouses. You won’t kill more than an hour at the veep museum, so keep the outhouse tour as your backup plan. Sam Stall lives in the cradle of vice presidents with his son, James, and dog, Trudy. He really, really hopes that Mike Pence doesn’t become the Hoosier state’s sixth veep.